How does that line go from the old Christmas carol? 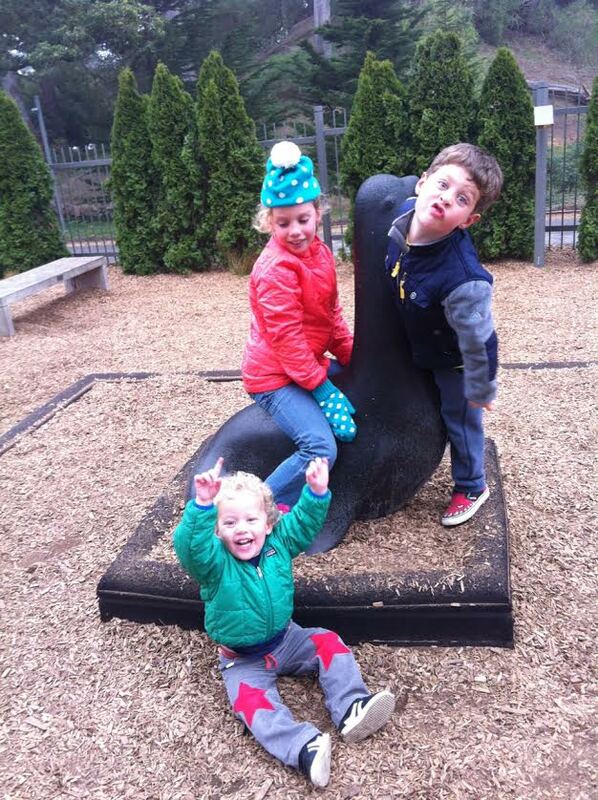 e are currently in my kids’ 3rd and final week of winter break from public school. Most dental offices close down for the two weeks around Christmas and New Year’s, so I got a good, strong 2-week dose of family time. But as much as I love my children, I have to say I practically skipped out of the house Monday morning on my way back to work. 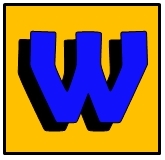 UnDorkMommy has been doing a herculean job keeping them entertained and out from in front of the TV/computer screen this week. So when Episode IV suggested that they go to the Academy of Sciences yesterday, everyone was onboard. The Academy is a two hour drive away, so these trips generally mean a long haul both up and back, with a napless baby thrown in for good measure. That’s OK. You’ve gotta do that stuff every once in a while. The text messages I got throughout the day seemed to indicate that the kids were getting along amazingly well, and were having a great time. Cool. As it happens, Wednesdays are the days I teach at the dental school in the same city as the Academy of Sciences, and this particular Wednesday was the first day back. Through a cosmic alignment of circumstances we found the entire family in a city 2 hours from home on a day the kids didn’t have school and the dental students didn’t have any high-stakes projects going on. It was an opportunity I just couldn’t’ pass up. 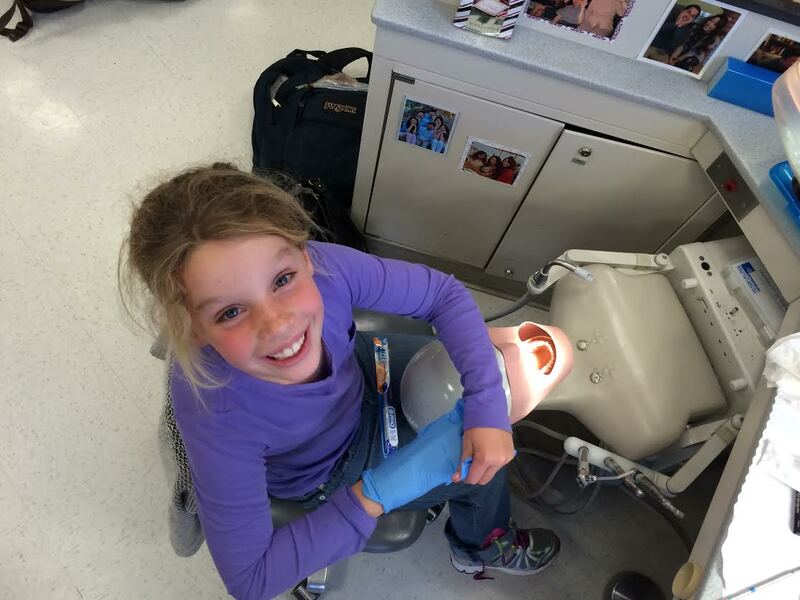 After some bartering via text messages with my wife (there was an over-tired baby and a 2 hour drive home to factor in) UnDorkMommy agreed to drive through the city and swing by the dental school so Daddy could give the big kids a tour (because let’s get real, nothing gives DorkDaddy a thrill like showing off his family). Daddy came down to the street in his white lab coat and picked them up curbside while the baby stayed (moderately) entertained by a DVD in the minivan with Mommy. 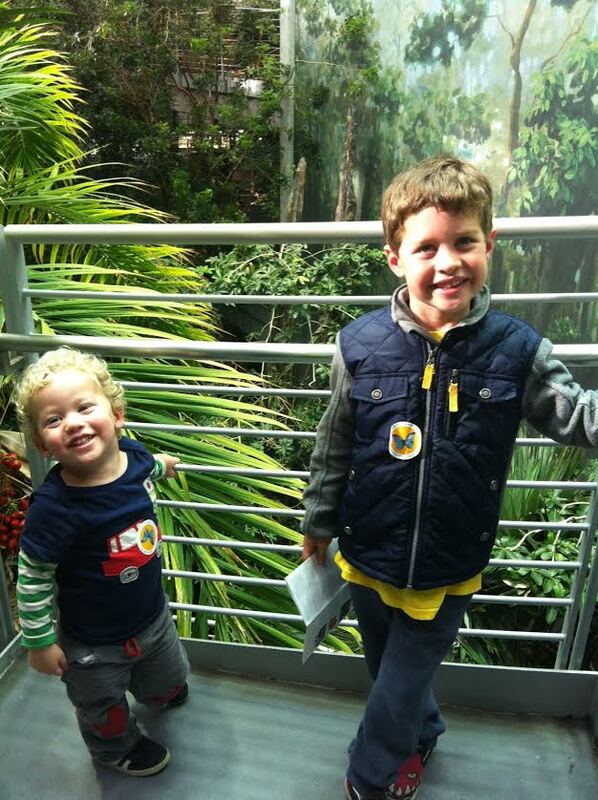 I took them to security and got them an official “visitors” badge. We walked through the clinic, a room filled with 200+ dental chairs and positively buzzing with patients, students, staff and instructors. They got to see students of mine, and shake hands with some of my former professors now colleagues. One of the administrators was pushing a cart around, overflowing with free toothbrush samples, so they filled their pockets. …I didn’t. Don’t worry. But I’m still considering it. Then it was a ride up the elevator to show them what a real dental school classroom looks like. We stepped into the back of the lecture hall – 150 empty seats all facing a projection screen at the front of the room. Episode IV turned up her nose immediately. “This classroom doesn’t look very fun” she said. I suppose I had to concede that one to her. “Oh, you want to see something really fun, do you?” I replied. The final stop on our tour was the dental school equivalent of Willy Wonka’s Chocolate Room – the Sim Lab (cue dramatic music). Imagine 150 first year dental students in a room as deep as the eye can see, all working furiously away, drilling little plastic teeth in 150 mannequin head work stations. Nothing gives me a thrill quite like showing off my family. If Episode V looks a little too comfortable in that chair, there’s a reason. 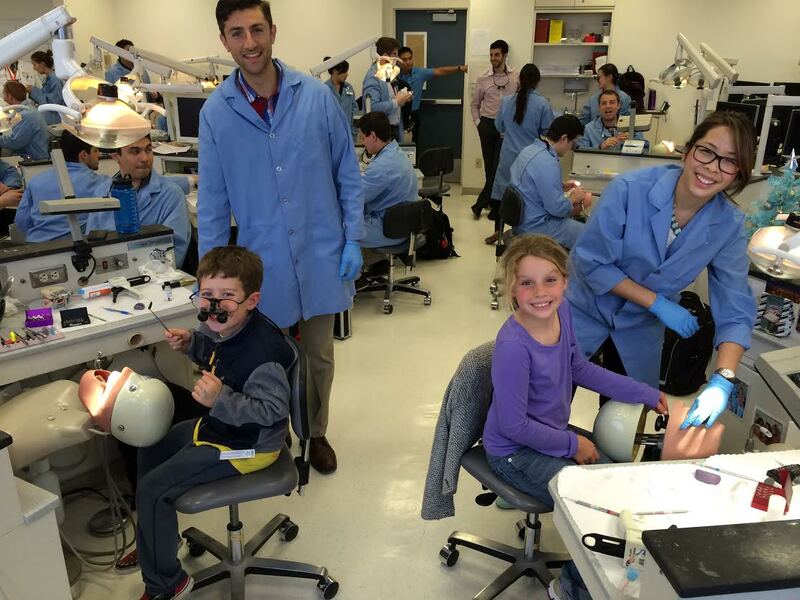 I want to give massive thanks to my students who whisked up my kids, sat them down at the workstations and let them be real dental students, if only for a few minutes. 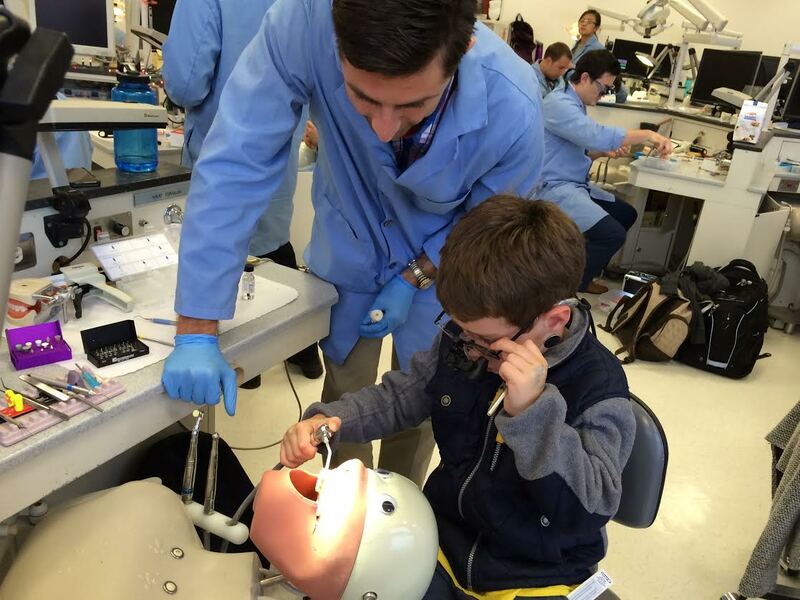 For what it’s worth, I like to tease my dental students with the fact that my 5 year old son has done more real life dentistry than they have. They uaually laugh at me and say “yea right”. Then I show them these pictures and they realize I’m not joking. She’s got him right where she wants him. I also want to give massive thanks to UnDorkMommy who tacked on an additional 45 minutes to the daytrip, even though she already had a melting down baby and two tired, overstimulated big kids to deal with. She knows, as I do, that if your kids are going to dream big, they have to be able to picture themselves in those dreams. 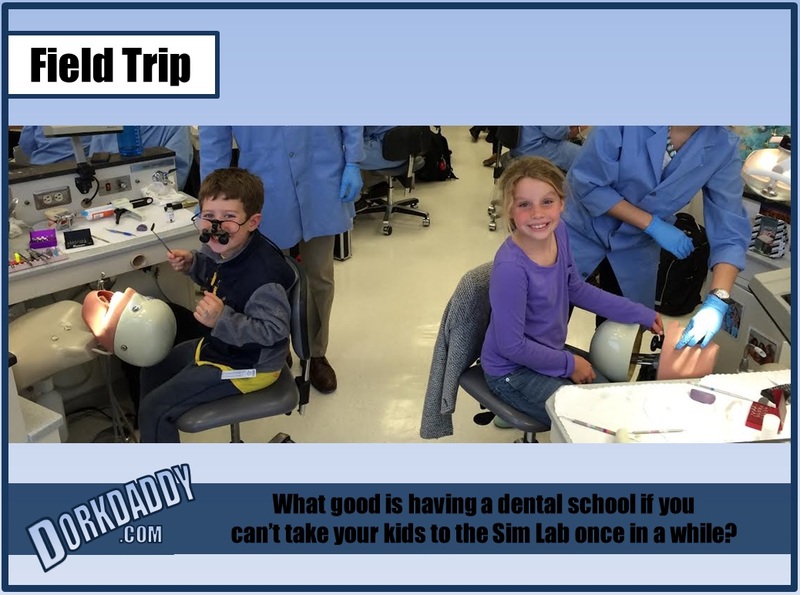 Besides, what good is having a dental school if you can’t take your kids to the Sim Lab once in a while…?